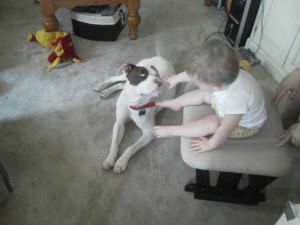 Pit Bulls and related “bully breeds” are often viewed as dangerous and mean. In reality, very few are that way, and most that are are trained to be that way or severely abused. By nature, most bully breed dogs are giant babies. Certainly the ones in my book are. My neighbor has a pit mix named Tiger, who was afraid of me for the first few weeks after we met. Sure he’d bark when I was out in the yard, but if I said hello to him, he beelined it for the safety of indoors. Now that he’s used to me, I must tell him hello whenever we’re both outside. He also requires I allow him to give me a big doggie kiss. A simple pat on his head just won’t do. As you can see from the photo, Adam is also a big baby. He’s looking for his forever home in Delaware.